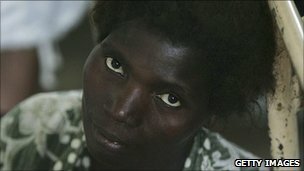 The following article from BBC News describes the misuse of charitable funds in Malawi: targeted for health improvements, government money given to HIV positive civil servants was spent on beer and prostitutes. This story brings up a thousand questions of morality, philosophy, humanity, charity and simple economics. At WCSU, I use an ethnography by Katherine Dettwyler about her research on childhood malnutrition in Mali called Dancing Skeletons: life and death in West Africa. In one chapter, Dettwyler encounters difficulties in trying to understand what women would buy if they had more money to spend on food. First, they wanted to know where they would get this 'hypothetical' money. Then, they commonly said they would buy non-food items like shoes or cloth. When Dettwyler insisted the money had to be spent on food, they said they would buy bread, potatoes or macaroni, high status foods generally purchased by foreigners, instead of protein and vitamin rich foods that would be better for their children's health. As the author concluded, despite high incidences of childhood death from disease and malnutrition, "Without exception, everyone felt that they were able to purchase food for an adequate diet with the money they currently had" (53). Just as, apparently, the workers in Malawi did not connect better nutrition with better health, these mothers saw nothing unhealthy about a daily diet of millet and rice. With that in mind, will these government workers actually eat the food in the nutrition bags that will now replace their extra cash allowance? Who can dictate how charity is spent? Moreover, when a person is given charity, does the donor have a right to dictate how the funds are spent? If these funds are not spent as the donor intended, is that wrong? In other classes at WCSU, these questions regarding charitable giving arise. In one book by Anne Fadiman, The Spirit Catches You and You Fall Down, a young, immigrant Hmong girl living in California is struck by violent epileptic seizures and her unemployed parents spend their welfare and supplemental income money on the purchase of pigs to sacrifice, soul calling ceremonies and flight tickets to visit a shamans in Minnesota. At the same time, they refuse to follow their American doctors' orders regarding prescribed medicines and diet for their daughter despite her continued seizures. Fadiman concluded that the Hmong were not unethical, but differently ethical in their choices. Is it wrong for a person to spend their welfare money as they choose? How about charity? If a person donates money to the poor, should that money be earmarked or is it simply a gift to be spent as the recipient pleases? In another ethnography, one by Elizabeth Fernea entitled Guests of the Sheik, about the author's life in a small, rural Iraqi village when she accompanied her husband abroad for his doctoral research, charitable giving as observed by Shiite Muslims in is explained. When Elizabeth's husband Bob decides to be nice and give a sack of food to a poor man in the village he is gently told by his friend and employee Mohammad that a cash gift would be better. When Bob explains that he would rather give food as the poor man would probably spend the money on cigarettes or worse, Mohammad explains that the person receiving charity has just as many rights as the person doing the giving. Though not completely comfortable with this idea, Bob chooses a cash gift. Is realistic to expect these HIV positive civil servants in Malawi to spend extra cash on food instead of pleasure? Are they wrong or unethical for misusing these funds? Will these workers eat (or sell?) their nutrition bags, and if the government has chosen to make the gift, does it matter how the gift is used as long as the recipient is happy? As someone who has worked many years in the area of humanitarian aid, I still struggle with my own and other people's expectations regarding gifts/charity/aid to the poor and needy. Notwithstanding issues regarding the use of public funds, in general, if one's gift is well-thought out and well-delivered, one can be somewhat assured that outcomes will unfold as planned; however, perhaps in some contexts, rigid expectations sometimes need to be set aside, with satisfaction instead taken in the good intent, not just the good results. Malawi's government has scrapped extra payments to HIV-infected civil servants, accusing some of them of spending it on prostitutes and beer. The $35 (£21) monthly payment would be replaced with "nutrition food bags", said government official Mary Shaba. This would stop workers from using the money on prostitutes and "further spreading the virus", she added. The scheme was intended to help sick workers improve their diet. Ms Shaba said the scheme, introduced in 2007, had also been abused by civil servants who falsely claimed that they had HIV so that they could cash in on the allowance. Nearly 40,000 civil servants, out of about 170,000, claimed the allowance. The average monthly salary in Malawi's civil service is $100. Around 14% of the country's population is HIV-positive. The illness has cut life expectancy in the southern African nation to 36. The move comes as the UN hosts a summit to mark the 30th anniversary of the first diagnosis of Aids.